This page is dedicated to helping our club members identify problems and solutions associated with diseases of honey bees. There are numeros useful links at the end of this page. There are several ways that we can address this which we can discuss with the bee inspector at our next meeting (October). The following is a quick step that we can use to quickly check for them and reduce their population if they are found! Cut a piece of corrugated card board into a strip so that you can slid it into the hive with a tab that will allow you to remove it quickly. Remove one side of the corrugated board so that the grooves are exposed. Have a clear plastic bag on hand that the strip will fit into. Place the strip on the bottom board with the exposed groove side down and leave it in for a couple of days. With the bag ready, pull the strip and place it in the bag and seal it. Check to see if you have any small black beetles with antennas that look like a club because of a nob in the end. They will be about the same size as a wax cell opening. If you find them, seal the bag and get rid of them. Place in several bags to keep them from creating a hole to get out. Soapy water will kill them in the bag. If you had beetles, keep repeating this procedure to kill as many adult Small Hive Beetles (SHB) as possible before winter. There are other methods (chemical and oil trays on the bottom board) but it will cost us money and time to react at this time of the season. There is hope that the cold will stop them before spring but I’m not planing on it. Their eggs will not hatch below 50*. The adults will beg from workers and be fed. The adults can survive in the winter cluster. These facts are what I have read but I don’t know as true. They will ruin wet supers in storage as well. Strong colonies can better defend themselves. Look for them in your weaker colonies. 1/23/2014 – NBS News Science article about a tobacco ringspot virus killing honeybees. Nosema caranae is a fairly new disease. This particular disease is generally without symptoms – the older bees just disappear. See this article from Scientific Beekeeping. From August meeting .. James/Linda and Jay use a feed stimulant with essential oils called Honey Bee Healthy. James/Linda have also used Nozevit-Plus to keep the honey bees intestinal tracks healthy (early spring and fall feedings). Both these products use natural ingredients. Lee used Fumagilin-B to treat his nosema inflicted hive last fall. IMPORTANT WARNING – None of these treatments should be done when honey supers are on and you must not use honey from the brood boxes/hive bodies that were in place at the time of the treatment. Jerry recalled that several members that lost their hives went ahead and extracted what honey was available in the lower boxes. Had anyone treated those hives, they would not have been able to use that honey. It IS good honey for the bees’ consumption, however. 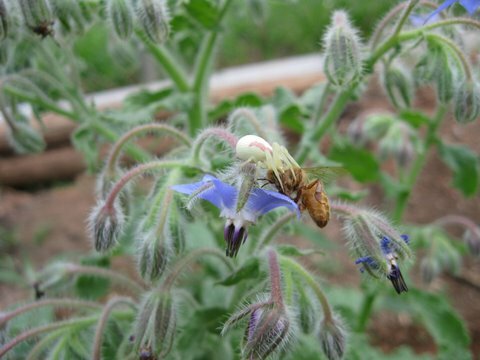 Tom Allen shared this picture taken by Jeremy Gibbons of a white spider holding one of Jeremy’s bees on one of the borage plants in his yard. Great picture (maybe the spider doesn’t quite qualify as a pest … but he’s posted here anyway). James & Linda have one hive infested with Varroa Mites (as pointed out by Troy). 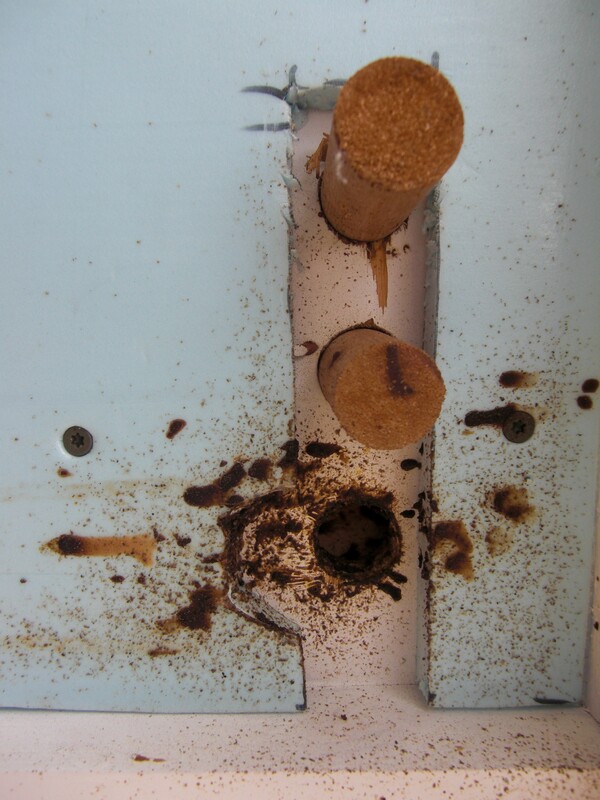 They treated their hive with a Mite-Away II single application formic acid pad. It is a 21 day treatment and if temps exceed 85 degrees, the pad must be removed until temps drop. 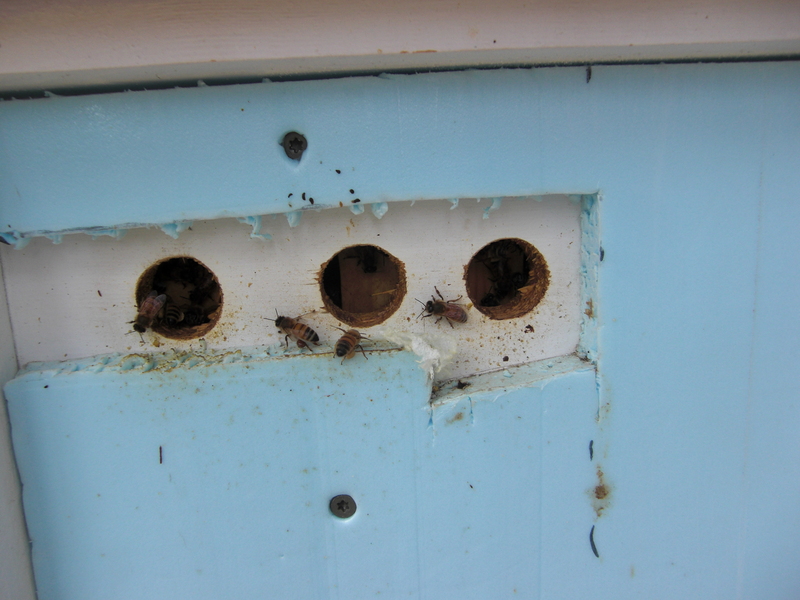 The honey super was removed, the pad was placed on 1×1 strips above the brood frames and a fume-borad, then the hive lid was installed. Since temps had to be between 59 and 85 degrees, treatment was later in the spring than preferred. A link at the bottom of this page will show a YouTube video of varroa mites on honey bees so you know what to look for if you’ve never encountered the little pests. Also see the Science Buzz link below for more information on varroa mites. During the May meeting, Lee discussed how he had lost one of his hives to nosema (an intra-cellular parasitic disease in bees caused by one of two (or both) fungi named Nosema apis and Nosema ceranae). When bees ingest the spores, it can weaken and kill them. Lee is not certain if his colony was weak and therefore was subject to the disease or of the disease weakened his bees. The following 2 pictures are from Lee to show other members what the evidence of Nosema looked like. Science Buzz – Marla Spivak answers questions about bees and Varroa Mites (Note Marla Spivak is a University of Minnesota entomologist and is extremely active in researching honey bees. There is a lot of information in the Q&A provided by this link.